Two Dundee school pupils have cast their gaze firmly on their future careers, completing eight-week work experience programmes with Hillcrest Group of Companies. 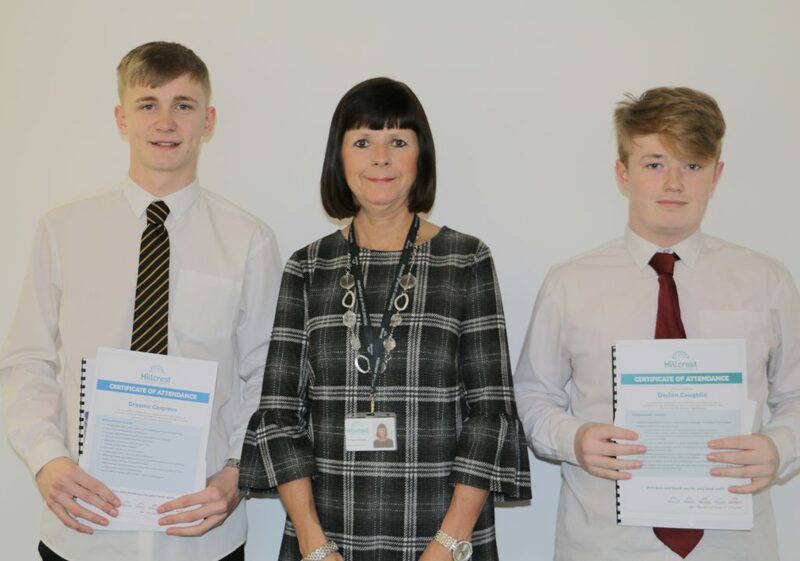 Declan Coughlin from Harris Academy and Graeme Cosgrove from Craigie High School – both fifth year pupils, got hands-on in their chosen areas of the company supported throughout by Hillcrest mentors. Declan’s placement saw him join the fast-paced IT department, which provides and manages the IT, communications and tech across Hillcrest’s group of companies. Supported by IT Service Desk Team Leader Jamie Sharp, Declan got stuck into wide range of tasks over the eight weeks including upgrading staff computers, creating user guides and basic coding. Placements complete: From left – Graeme Cosgrove, Hillcrest HR Business Partner Pamela Cavanagh and Declan Coughlin. Other achievements that Declan was proud to accomplish included working with business information systems such as databases and CRM software, and successfully working within a team boasting a variety of specialisations. Graeme’s eight-week placement saw him working with Hillcrest Maintenance Service’s joinery team, supported by Operations Manager Gavin Scott and Maintenance Operative Phil Dunlop. This position provided Graeme fantastic insight and experience within the joinery trade, as the team undertook a considerable programme of kitchen replacements. Throughout the eight weeks, Graeme too built up a list of achievements. These included working as an effective team, the correct use of personal protective equipment (PPE), building an understanding of health and safety in the workplace, and correct use of hand and power tools. In addition, and showing outstanding dedication to learning, Graeme even chose to attend an extra day to build up as much experience as possible.